Day One. Start with the master. They didn’t make a huge impact at the time: it was more a lingering thing. Although they were from two generations previously, having been written in the 1930s and 1940s, they were probably the first stories I ever read which were in recognisable settings, with – and this is the important bit – people who spoke in a recognisable way. Seven years later, part time at university and working as a postie, I picked up an English paper. It wasn’t my first choice, but I was trying to get into Law School and you had to do two English or two Philosophy papers as part of your Law Intermediate. This collection was part of the course and I picked it for the first essay question. And when I started reading the stories (about two days before the essay was due, sadly) the characters seemed to peel from the pages and stick to the brain like the literary equivalent of decals. (now there’s a word I haven’t used since I was about 12). 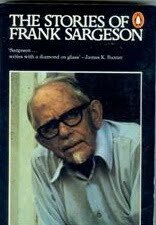 Sargeson’s minimalism was perfectly formed for the way New Zealanders, especially male New Zealanders of the middle 20th century, speak and think. I’ve tried reading some of his later work but nothing beat this collection. Previous Previous post: Python One, Cat Nil. Not sure if the story Toothache is in this volume, but if membery serves me correctly it's a very good depiction of how an older woman thinks and speaks too.